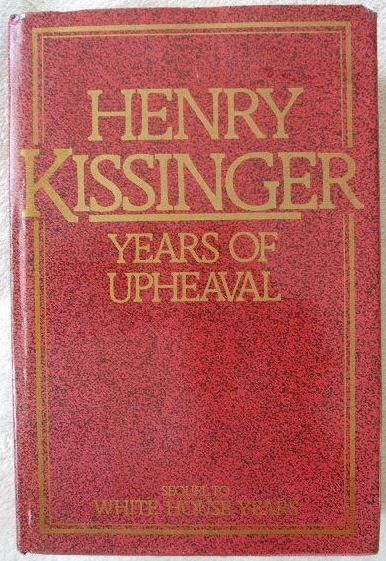 First UK Edition, first print hardback of YEARS OF UPHEAVAL, by Henry Kissinger and published by George Weidenfeld and Nicolson Limited, London, in 1982. 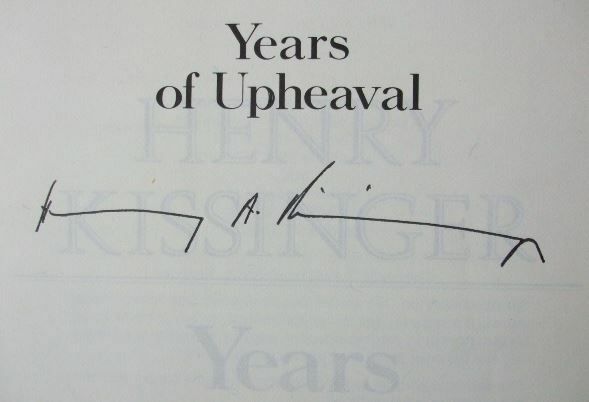 Signed by Kissinger on the half title page. The book is in very good condition (clean red cloth boards with facsimile gilt author signature on the front board and gilt lettering on the spine which has minor rubbing to corners and a light crease across the top corner of the front board) with light wear to the dust jacket which is not price clipped (minor creasing to the edges, slight rubbing to the corners). Internally, the pages are clean and tight and there are no tears and no other inscriptions. There is light foxing to top page edges. Henry Kissinger was the fifty-sixth Secretary of State of the United States from 1973 to 1977, continuing to hold the position of Assistant to the President for National Security Affairs which he first assumed in 1969 until 1975. Born in Germany, Dr. Kissinger came to the United States in 1938 and was naturalized a U.S. citizen in 1943. He served in the U.S. Army and attended Harvard University, where he later became a member of the faculty. Kissinger is a political scientist, who, as adviser for national security affairs and secretary of state, was a major influence in the shaping of foreign policy from 1969 to 1976 under Presidents Richard M. Nixon and Gerald R. Ford. Among the awards he has received are the Nobel Peace Prize, the Presidential Medal of Freedom, and the Medal of Liberty. After leaving government service, Dr. Kissinger founded Kissinger Associates, an international consulting firm, of which he is chairman. After his term, his opinion was still sought by some subsequent U.S. presidents and other world leaders. Kissinger has been a prolific author of books in politics and international relations with over one dozen books authored. He has written many books and articles on United States foreign policy, international affairs, and diplomatic history. Among the awards he has received are the Guggenheim Fellowship (1965-66), the Woodrow Wilson Prize for the best book in the fields of government, politics and international affairs (1958), the American Institute for Public Service Award (1973), the International Platform Association Theodore Roosevelt Award (1973), the Veterans of Foreign Wars Dwight D. Eisenhower Distinguished Service Medal (1973), the Hope Award for International Understanding (1973), the Presidential Medal of Freedom (1977) and the Medal of Liberty (1986). "In Years of Upheaval, Henry Kissinger recalls the turbulent years of the second administration of Richard Nixon, which began in January 1973. Two momentous events and their consequences dominate this account: the Watergate scandal, and the 1973 October war in the Middle East. The book opens at the Western White House in August 1973, when Dr. Kissinger is told by the president during a poolside conversation that he is to become Secretary of State. The memories that follow are a rich compendium of his experiences in the months before and after the appointment: including an eerie trip to Hanoi shortly after the Vietnam cease-fire; efforts to settle the war in Cambodia; the tempestuous Year of Europe; two Nixon-Brezhnev summits and the controversy over dtente. Dr. Kissinger's dramatic, day-by-day account of how the Middle East war was transformed into the beginning of peacemaking shapes the climactic chapters of the book, in counterpoint to the worsening crisis at home, which culminated with Nixon's resignation. His frank portrait of Nixon's last days in the White House is perhaps the most perceptive to date. Candid appraisals of world leaders, including Nixon, Golda Meir, Anwar Sadat, King Faisal, Hafez al-Asad, Chairman Mao, Leonid Brezhnev, Willy Brandt, Helmut Schmidt, Georges Pompidou, to name but a few - appear throughout the book, as do Dr. Kissinger's insights on war, peace, diplomacy, and the nature of political leadership. At once illuminating, fascinating, and profound, Years of Upheaval is a lasting contribution to the history of our time by one of its chief protagonists." 1283 pages. Illustrated with 40 pages of black & white photographs. NOTE: This is a heavy item, weighing around 1.6KG when packaged.